Sorrowmurk is a veteran Russian psytrance producer and beloved sound pirate hailing from Moscow, that weird, cold metropolis on the far edge of Europe. After a few years reframing his music concept and production approach the ex-Dissociactive project member brings us eight previously unreleased night-time epics dedicated to busy Moscow city life and its crazy, mystic trance community. Identity Disorder reflects, in an ironic way, the psychic metamorphosis of a rat race character trapped in this burgeoning metropolis. With a full-power crunchy sound, this album is wrapped in darkness, but also retains a good sense of humour at its core. With knowledge of secret substances and body mechanics this album serves as the best medicine against concrete jungle fever and offers a gateway to the heady warmth of beach party season. Special cover art with famous Moscow landmarks is hand-painted expressly for this project by one of the first Russian psychedelic artists, Konstantin LordJaad. Mastered by Mario Darkshire. Presented by Basic Algorithm records. The devil is in the detail! From Russia with love! MP3 Download | FLAC Download | WAV Download · Download count: 10,581. WOW ! Instant download .. AMAZING work here !! Exc dude , i been waiting for this so long!!!!! Отличная музыка! Просто супер! Третий день по кругу дисочек гоню! Респект! 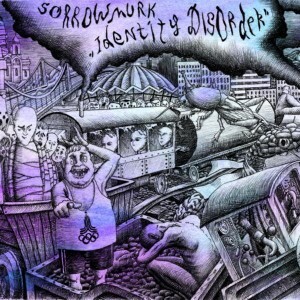 Sorrowmurk is asking us to deal with a lot here, and while listening to his latest project, my emotions ranged from utter joy all the way to exquisite ecstasy! Quite a reversal from the album’s contents, yes? Great work!! Can’t beat that bassline or intense emotion. Jeez loweez, very little trance impresses me this much. Truly impossible not to share. I’m trying to focus on work, but all I can think of is who else I can share this album with. Excellent job Sorrowmurk. Beautiful melodies, driving energetic base lines, chilling atmospheres! It’s for albums like these that I keep returning to ektoplazm month after month. thanky for greate music! listened this only today in 2017 and it my favorite psychedelic trance album now.